Hearty grilled steak is a classic dish that everyone should know how to make. A good steak practically makes itself but there are some nuances that can help make a good steak even better. Here is the fast and easy version: 1) Buy a good cut of beef steak, 2) Course salt and freshly ground black pepper both sides of room temperature meat, 3) Throw on hot grill and cook until done to your taste. 4) Letting the meat rest. Choice of meat - The absolute most important part to cooking a good grilled steak is the raw ingredient. A good cut of meat can practically be thrown on a hot grill without any seasoning or other preparation and come out tasting great. A poor cut of meat will be dry, tough and lack flavor no matter what you do with it. In general, I recommend buying the best cut of meat you can afford, but keep in mind that different cuts have different uses. First of all, if you can afford it (and it ain’t cheap! ), buy Prime dry aged beef. USDA prime meat is the best there is and you’ll taste the difference. Dry aging helps to concentrate the flavors and helps guarantee a rich, juicy grilled steak. If Prime is not available, USDA Choice is the next step down and can definitely make a tasty steak. Choice is available in most supermarkets. Select, the next grade down, is the most common grade you will see in supermarkets. It will lack some of the flavor and juiciness of the higher grades. It is not always appropriate for simple grilled steak and would probably do better with moist cooking, like a stew, to add tenderness and flavor. What makes Prime and Choice meat so good? 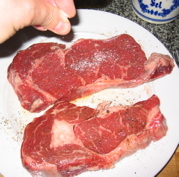 The higher grades of meat have more marbling, those lines of fat that run through the cut of meat. While big chunks of fat may not be good for a piece of meat, this marbling is perfect because as the steak cooks, it liquefies and permeates the lean meat. This leads to rich flavor, juiciness and a tender texture. The classic cuts for grilled steak are Rib Eye and New York steaks. Other similar cuts like Prime Rib and Porterhouse can shine on the barbeque or fire pit as well. More lean cuts like the tenderloin (known to most as Filet Mignon) are super tender, but because they are more lean with less marbling, they don’t have as much inherent flavor. 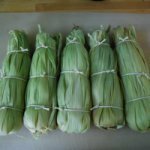 These cuts are better if they are flavored with a marinade or with a great finishing sauce like Bernaise or Bordelaise (a red wine based sauce) sauces. A good cut of well marbled Rib Eye doesn’t need the extra flavor…in fact those rich sauces may actually detract from the perfect native flavor of the meat! So for your grilled steak buy a nice, thick, well-marbled cut of high grade beef and you will not regret it! Marinating and Seasoning - First of all, your raw steaks should absolutely be room temperature before putting them on the grill! This is an often-overlooked nuance of cooking a great steak. A cold steak, fresh from the refrigerator will caramelize and burn on the outside quickly on a hot grill, but the center will still be cold. When you serve a grilled steak, even if you prefer it rare or medium-rare, the red center should be at least room temperature or warm. If you wait for the center to heat up on the grill, the outside will be burnt to a crisp! So don’t be afraid to take those steaks out early, sit them on a plate on the kitchen counter while you prepare the grill or other dishes. Again, higher grade, well-marbled cuts of meat have so much delicious flavor that they don’t need much in terms of added flavor. You can certainly choose to marinate them or add sauces but for the grilling purist, just some seasoning with salt and pepper will do. Frankly, you could throw a good steak on the grill with nothing and it would taste good. But at the very least I recommend seasoning liberally with freshly cracked black pepper and a good course salt. Don’t be afraid of using salt, it is one of the most important aspects of any dish. A well-seasoned dish can sing while the same dish lacking appropriate seasoning will be lackluster. Salt brings out the subtle flavors that are inherent in the meat! 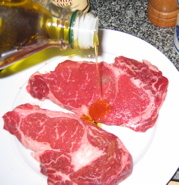 Before seasoning with salt and pepper, I sometimes drizzle the steaks with some extra virgin olive oil and rub it into all the surfaces. I like the subtle flavor it adds and it helps the meat cook nice and evenly. You can let the meat sit for a while with the olive oil and pepper on it while your meat is coming to room temperature, but don’t put the salt on too early! Wait until the last minute before you throw it on a hot grill to season with course salt. If you don’t, the salt has a tendency to draw out fluid from the meat (remember osmosis from you high school chemistry class?). If you prefer a little extra flavor for your grilled steak, maybe because you are using a lower grade of meat or a cut that is leaner, there are many options you have for a marinade. You can rub the steaks in some Dijon mustard (I especially like the course country style Dijon), drizzle with Worcestershire sauce or even use a pre-bottled steak sauce you find in the market. But remember, if you spend half your paycheck on a couple 2 inch thick USDA Prime Rib Eyes, you probably want to enjoy the steaks for what they are. Too much sauce or marinade will mask the great flavors in that beautiful meat! Grilling Your Steaks - Steaks can be grilled pretty much anywhere, over wood in your fire pit, on a gas or charcoal grill, or even right on your stove on a grill pan as shown here. Whichever method you use, first get your grill nice and hot! Steaks like high heat to really sear the outside while keeping the inside nice and juicy. If you cook them too long over too low a heat they will dry out, leaving your beautiful steak tasting like leather! I like to rub my grill grates with a little olive oil first. Then throw those room temperature, well-seasoned beauties on there. There are two mistakes people often make when cooking meat on a grill. First of all, they turn them too fast and end up turning them over and over several times. This doesn’t help the meat cook evenly and in fact can dry it out. Instead, leave the meat on one side until it has gotten nice caramelized dark grill marks on that side. You can peak periodically to check. Also, when fluid starts to puddle up on the topside of the meat, its ready to flip. Flip the meat and then let it cook until done. The other mistake beginners make is pressing on the steak with their spatula. This does not help the meat cook and in fact pushes out the delicious, rich juices in the meat, further drying it out. Don’t fuss with the grilled steak while it’s grilling! 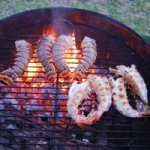 For some tips on how to tell when grilled meat is done, CLICK HERE. Letting your grilled steak rest - This is another often overlooked part of cooking meat dishes. Right after taking a piece of meat off a hot grill, the juices and heat within it are all in motion and disorganized. You need to give it a chance to equalize. Set your meat on a plate or platter and set aside for 5 – 10 minutes. If you are worried about them getting too cold, you can cover them loosely with a piece of aluminum foil. As they sit they will throw off a bit of fluid (which is quite tasty and can be used to make a sauce or even just served along with the meat). After a little rest, your meat will be tenderer and evenly cooked. The interior of the meat actually continues to cook a bit after taking it off the grill. Your beautiful grilled steak is now ready to serve! Enjoy it alone or with a side of your choice. For those who love extra flavor, you can add your sauce now or even crumble some blue cheese over your grilled steak. But don’t forget to have a tasty beverage to wash it down with! A hearty red wine with some structure (Cabernet Sauvignon, Syrah, red Bordeaux, red Rhone wines, and even some heartier Pinot Noir-based wines) will stand up to the rich flavor and the fat from the marbling in the grilled steak will stank up nicely to the tannins in these bigger wines. Alternatively, a good beer is nice with a steak as well. Try to avoid the lighter lager and pilsner type beers and go for something with a bit more oomph. Maybe an amber ale or even a porter or stout would do nicely with steak! 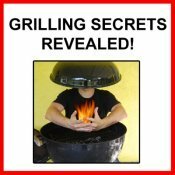 If you liked this grilled steak recipe, check out some more of the Firepit and Grilling Guru’s great barbeque recipes!